The Chinese stock market even broke through its August 2015 lows today. A sudden Chinese stock market crash took China's stocks down some 40% in August, sending ripples through global stock markets. Today's drop from China's stock market had a similar impact on global markets. Hong Kong's Hang Seng Index finished the day down 1.4%. Australia's S&P/ASX 200 fell 0.3%, and South Korea's Kospi slipped 1.1%. European markets were also down across the board. In mid-day trading, Britain's FTSE 100 dropped 1.5% to 5,832.45. Germany's DAX lost 1.4% to 9,657.65. France's CAC 40 declined 1.4% to 4,252.75. The three major U.S. benchmarks all lost more than 2.5% right after the opening bell. 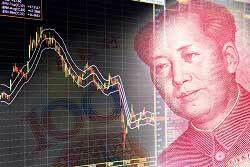 Escalating concerns about a slowdown in China, the world's No. 2 economy, a weakening currency, and chaos in its stock markets continue to rattle investors worldwide. The latest plummet in the Chinese stock market came after state-run media reported that some Chinese banks were no longer accepting stocks as collateral for loans. Government data also showed weak demand for bank loans. China's new bank loans came in lower than expected in December. Lenders sharply curbed activity at the end of the year as economic growth slowed and debt climbed. Chinese banks issued 597.8 billion yuan ($90.7 billion) of new loans in December, below forecasts for 700 billion yuan. The figure was down substantially from 708.9 billion yuan in November. Bad loans at China's commercial banks have risen for four consecutive years. At the end of September, the bad loan tally stood at 1.19 trillion yuan, up from 842.6 billion yuan year over year. China's central bank maintains that the nation's money supply shows ample liquidity in the economy. But economists warn that Beijing may need to implement further monetary measures to boost and bolster its economy, which has seen amplified capital outflows this year. Six benchmark interest rate cuts and several reductions in bank reserves have done little to boost China's economy. The Asian nation is expected to report its slowest growth in a quarter of a century for 2015 when figures are released next Tuesday. More dismal data will undoubtedly push the Chinese stock market even lower. So the Chinese liar(s) all are down in the dumps about their Stock Market fueled lies biting them in the behind? Oh too bad that liars always lose in the end! Don't buy anything Chinese! Junk used to come from Japan but that changed and now the junk comes from China!